As the Trump Administration continues to deal with the fallout from their rescinded policy of separating migrant children from their parents at the border, they are issuing a new ultimatum to migrant families. NBC News has picked up on the new instructions the White House is giving to border patrol agents. 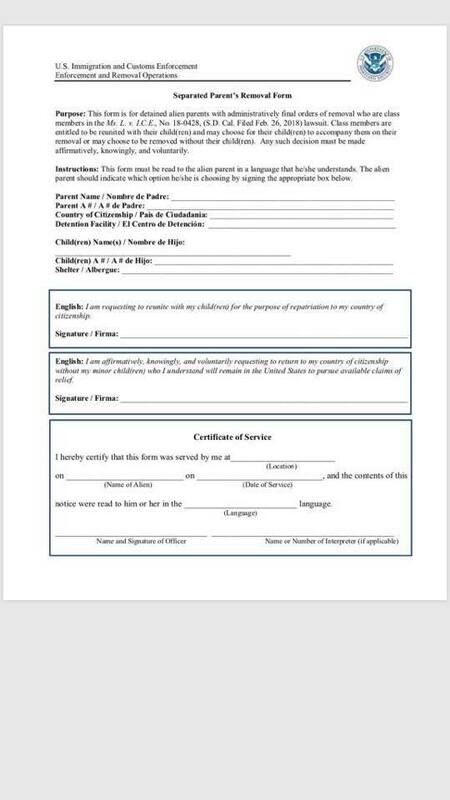 The form indicates that law enforcement officials will present migrant families with two choices: either leave the country with their children, or leave without them. The development comes after the Trump Administration received a federal court order demanding that they reunite families torn apart by the president’s border policy, and they must also allow separated migrant children to communicate with their parents if they were not previously allowed. According to NBC, the new instructions do not allow for the reunification of parents and children who were detained and separated as they wait to hear whether they will receive protective asylum status. Even though Trump rescinded his controversial policies last month through executive order, thousands of kids remain apart from their families, and its unclear if the government has any kind of mechanism to facilitate reunification.